From an article published on the Mail online 5 May 2015 - one woman's story about symptoms that were missed until it was too late and she lost the sight of one eye. Please don't let it happen to anyone else. An excellent day on 19th April - quite a buzz around the room. Our first speaker, Dr Neil Basu, has provided a copy of his presentation on fatigue which I attach HERE. It is probably one of those occasions when 'you had to be there' because some of the slides make little sense without the dialogue but the fact that the importance of managing fatigue is now being researched is good news. Of course there are meetings all over the UK, not just in Scotland - but we do provide links. 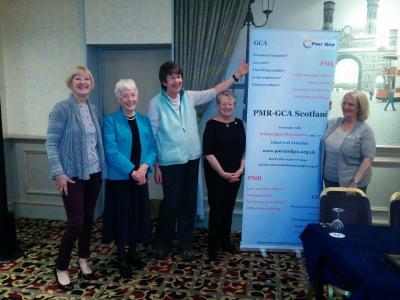 Very few photographs this year - just this one of the two visitors from the North East of England (Lynne Boyle and Margaret Wright), one from the North West (Anne Chambers), our founder Jean Miller and me (Bea Nicholson - the tall one in the middle).